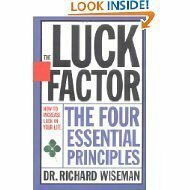 Dr. Richard Wiseman has some very interesting research showing how some people are luckier than others and why. It may be hard to believe you can PROVE luck and that some people have more luck than others, but he does it. He then proceeds to discuss four principles that are key to creating luck. Principle Two: Listen to Your Lucky Hunches. Lucky people make successful decisions by using their intuition and gut feelings. Principle Three: Expect Good Fortune. Lucky people’s expectations about the future help them fulfill their dreams and ambitions. Principle Four: Turn Bad Luck into Good. Lucky people are able to transform their bad luck into good fortune. I really enjoyed this book as it supports much of what I believe is true in that you can “create” luck by taking action, thinking positive thoughts, and being persistent in going after your goals. This book supports so much of what Krumboltz, Levin, and Mitchell have been espousing for years in the Happenstance Learning Theory. If you are looking for more evidence for using luck in your career advising / coaching, this is a great book to read.